Keshar Pipeline Fittings Private Limited [KPFL] is an innovative company that specializes in the design, engineering and installation of high quality pipeline weighting, insulating, pressure regulating and pipeline maintenance products used to guarantee the safe flow of fluids passing through pipeline transmission, distribution and process piping systems. 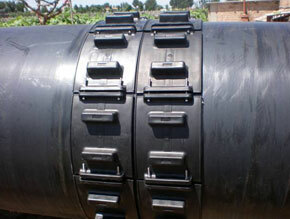 We offer a wide range patented accessories and fittings used in Cross Country Pipeline Construction. 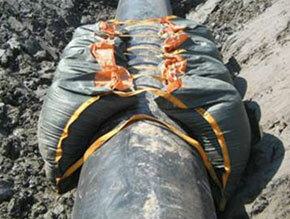 Geotextile Pipeline Weights is a patented system of weighting pipelines with high density aggregate gravel filled permeable geotextile sacks that are designed to either set-on or strap-on and straddle the pipeline in order to achieve buoyancy control. 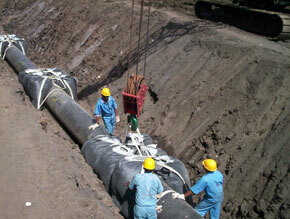 They provides an effective, economical and environment friendly solution to your pipelines weighting requirements. Casing Insulator is a patented series of polyethylene insulators that are universally applicable in the installation of pipelines when the carrier pipe runs inside a casing. They are used to support the coated pipe within a tubular casing, to electrically insulate the pipe from the tubular casing and to prevent damage to the coated surface of the pipe when the pipe is installed within the casing.